Dr. Ndiongue heads and provides guidance for the programs of pilot testing, technology demonstration, post-secondary training, the helpline and research sponsorships. 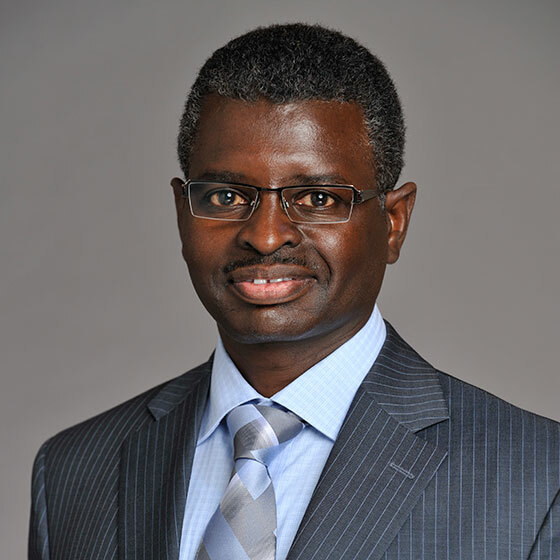 Dr. Ndiongue is the Chair of the Research Advisory Committee. He joined the Walkerton Clean Water Centre in 2005 and is the founding Manager of the Research and Technology Institute. He played major roles in the establishment of the Technology Demonstration Facility, the inaugural Mobile Training Unit and the development of the Research and Technology group. Dr. Ndiongue has over 25 years of experience in the field of water treatment. He holds a Ph.D. and Master’s Degree in Civil Engineering from École Polytechnique de Montréal, both specializing in water treatment. In addition, Dr. Ndiongue completed a two-year postdoctoral fellowship in the field of maintaining water quality in distribution systems at the University of Waterloo NSERC Industrial Research Chair in Water Treatment. He is a registered Professional Engineer of the Province of Ontario and is bilingual English/French.